Excel Integration Refresh: Save formatting and save time. Now when you export your QuickBooks reports to Excel, simply refresh your previously saved worksheet and your formats will be applied to the new report. QuickBooks remembers your Excel formats so you can work seamlessly. Industry Report Templates: Access industry specific report templates created by other QuickBooks users. Quickly find the report you need, with results displayed by your industry, user rating and report popularity. Click to populate the report with your business data. NEW! Income Tracker: Get an end to end view of all income related transactions all in one place with the new Income Tracker. Get real time data; no reports to run or data to gather. Take immediate action on transactions to get paid. Batch print or email transactions directly from the Income Tracker list and filter by transaction or customer. Bank Feeds: Input expense transactions quickly and easily, seeing transactions from multiple banks and accounts in one place. QuickBooks learns your common categorization so you don’t have to re-key them next time. Job Costing: Track reps by job and use customizable purchase forms to view expenses by rep. Filter reports by job status and run Work-in-Progress and Committed Costs reports. Email Enhancements: Include multiple attachments in QuickBooks transaction emails. See previous conversations in the email history list, and use customizable, auto-populating email templates for reliable communication. Income Tracker: Get an end to end view of all income related transactions all in one place with the new Income Tracker. Get real time data; no reports to run or data to gather. Take immediate action on transactions to get paid. Batch print or email transactions directly from the Income Tracker list and filter by transaction or customer. Client/Accountant Collaboration: Communicate with your accountant right inside QuickBooks. Conversations are tied to the transactions to which they refer for easy tracking. Inventory Pricing: Use drop-down menus to set conditions for price rules. The new Version also allows for quantity discounts. Finally, with manufacturing pricing discounts you can set conditions and date ranges for manufacturer-specific markdowns. Scheduled promotions with future start dates: Set start and end dates in the future to save time and hassle. Price Changes by class: Set price rules based on class. All these features are part of the new pricing module, to be sold separately by Intuit. NEW INTUIT MODULE: Advanced Pricing Core Features: Create thousands of advanced price rules based on any combination of customers, items, vendors, and more. Manage these rules with great flexibility, and change which rules apply at transaction time. Improved Auto PO’s: No more worrying about minimum or maximum stock levels. Just specify the inventory quantities you want to reorder, and QuickBooks automatically puts those quantities into POs. 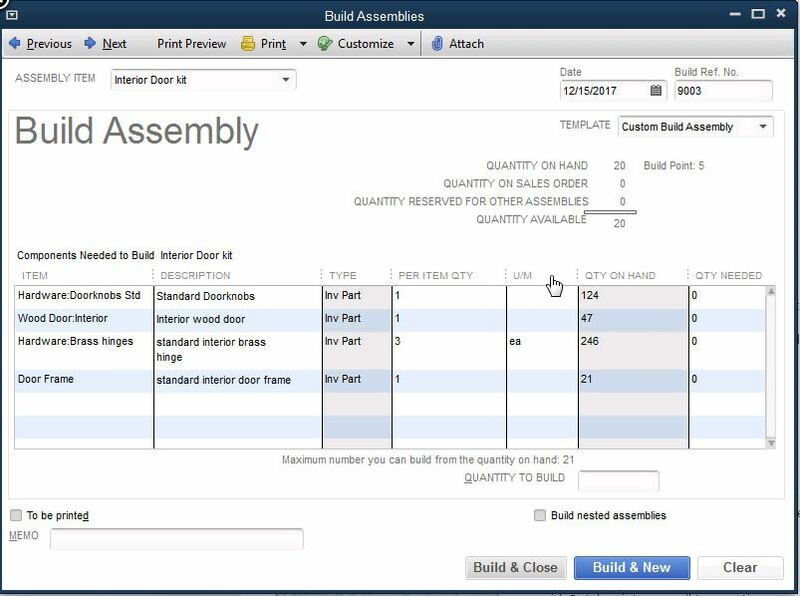 Assemblies: Build all sub-assemblies automatically with a final build, instead of entering them individual. Track items using the Where-Used report. Finally, continued improvements in the database total capacity and the ability to manage higher and higher volumes of information with this Version of Intuit QuickBooks, makes this Version a serious contender for the small to mid-size business. « What is a Sandbox Account in NetSuite ?